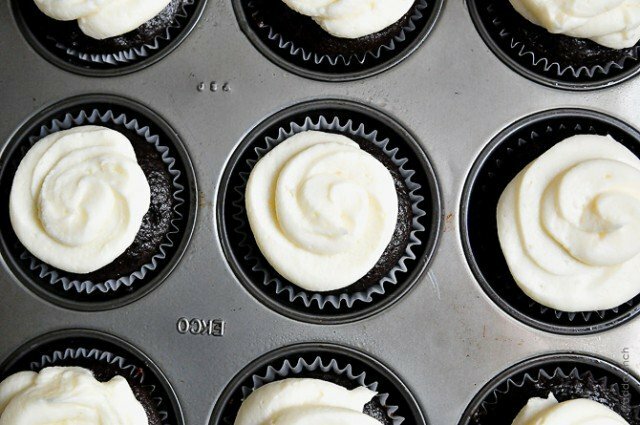 Can you make mini cupcakes out of this recipe? Any changes need to be made? Yes, I have found it makes about 3 dozen and takes 15 min to bake. I’ve been looking for a great chocolate cupcake recipe for years. So glad I found this one. I topped them with ganache and then decorated with fondant. A big hit, moist and chocolatey. So glad you liked it, Deborah! Thanks!!! Yes, you can use buttermilk in place of the milk called for in the recipe. This has been a hit time and time again since I first stumbled upon this recipe about 3 years ago. Thank you for being so brilliant! Always amazing, even a day or two after (on the rare occasion they last that long!). Hello! I have the “cake” version in my oven right now and I was checking out the adjustments you made for cupcakes. Just curious, I noticed that most of the ingredients are half that of the cake recipe except the cocoa powder (and other minor things). I wondered if you found that adding more cocoa powder was a hit and if I should even consider adding more cocoa powder to the cake next time! Thanks! I was also curious about why some ingredients were halved and a few had another ratio applied to them. I would love to know the answer! 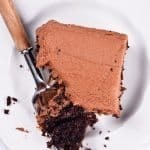 This is officially my go to chocolate cake recipe! I’m not a huge chocolate cake fan but the cupcakes I made were sooo yummy I had to eat two of them. Two thumbs way way up. I made these the day before yesterday and I seriously have to say they are the best chocolate cupcake I have ever eaten! I put cream cheese frosting on them instead of the buttercream and that with the fudgy chocolate e cupcake was absolutely delicious! I followed the directions of whipping both of frosting and the cupcake recipe on high for one minute after everything was mixed and it made everything so fluffy! I won’t use another recipe again for chocolate cupcakes! I am thinking of baking these for a party, is the espresso strong? and, can you bake them without? The espresso powder is is not strong, but you can omit if you prefer. The cupcakes always turn out wonderful and has become a huge hit with my family and friends. The only problem I have is with the liners pulling away from the cupcakes. I don’t see this happen with the other cupcakes that I bake. I am planning to bake this for a birthday party and wondering Is there a way to prevent the liners from peeling away? 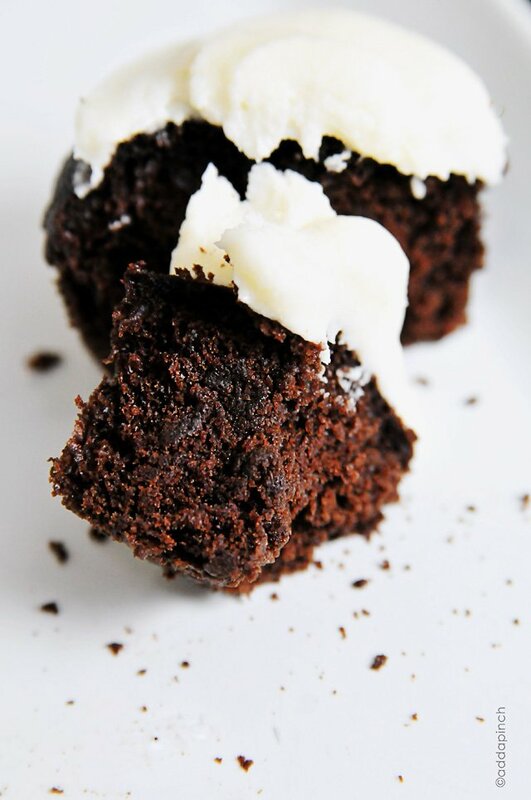 This is my go-to chocolate cupcake recipe! It’s fantastic! This is my go to cupcake recipe, it never fails and everyone loves it!!! 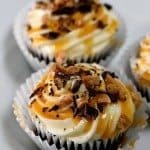 This is my secret cupcake recipe website. We’ve been making these cupcakes and chocolate cake for years and it’s an amazing recipe. People who try them think I’ve turned into some sort of baking professional. Any ideas for hot/humid weather and the buttercream icing? I’ve read shortening is better than butter for cakes sitting in the heat but I don’t want to impact the taste. I’m so glad you enjoy the cupcakes and cake Kyle! I’ve not tried changing the frosting recipe for the heat (and mercy has it been hot down south!) so I can’t say, but I am sure it would change the flavor. I hope this helps! Love this recipe and so does my fam, but I was hoping to triple or quadruple it. Has anyone tried that and had it turn out well? Or should I stick to two double batches. Instead of cocoa powder, can it be substituted with baking chocolate bar? I’ve not used chocolate bars in this before, Mancy. Enjoy! Is the espresso powder mandatory? Can this recipe be made egg free? If so would there be a substitute ingredient? Our family’s favourite cupcake recipe!! I never post comments on recipes, but I just had to with this one. These really are THE best chocolate cupcakes I’ve ever had. I’ve been baking cakes for years – these are the easiest, nicest looking, and best tasting cupcakes! Thank you! I am very impressed with this recipe. Thank you for sharing it! 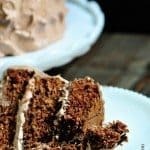 It’s exactly like old fashioned devil’s food cake, plus the recipe is exceptionally quick and easy. One dozen is the perfect amount of cupcakes for my household. Thank you for your wonderful recipe. I really loved it. I was so thankful for your recipe and added help when I made The Best Chocolate Cake (9×13) in two layers for my twins’ 5th birthday in May. It was delicious! Everyone crooned over it, and my girls were over the moon their Mommy made a big egg free cake for them instead of cupcakes. It had a blue sky and a huge rainbow and clouds. Giving this gift (they wanted so badly) to them was such joy for me. Now we are getting ready to bake unicorn mini cakes for my birthday with the cupcake recipe (egg free again). They are doing most of the ‘work’ this time. Special memories! Thank You! Hello.. what kind of milk do you use? I want to try this recipe. This was my very first recipe with my new stand mixer and I’m so happy (and thankful) that it turned out so well! Can’t wait to make these again – thank you for the awesome recipe. Made these – and they were a huge hit. I, like some of the other commenters, didn’t have/couldn’t find espresso powder. I subbed strong hot coffee for the boiling water – and the flavor held up well. The other thing I was surprised at was how thin the batter was. I was worried and doubled checked the whole recipe before tossing my hands in the air and going forward. I’m glad I did – texture was light and airy. I will definitely make again. 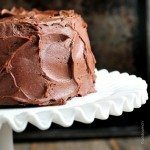 I have failed with chocolate cakes with oil before, so I was a little suspicious, but I’m so glad I made these! They were great and so soft. They came out perfect. And thank you so much for the conversion chart, because I live in the very metric Scandinavia. It worked really great and was much appreciated. Thanks for your awesome recipes! Countless chocolate cakes/cupcakes under my belt and this is my new staple. Perfection. I had a professional French baker at my Thanksgiving and he was floored by these cupcakes. Absolutely no alterations necessary. I’m not really one to ever write reviews but I LOVE this recipe! I bake often for friends and family birthdays or special occasions and every time I have made this recipe (which has been between 10-15 times) I get endless compliments about it. Everyone at my husbands work are always asking me to make a chocolate cake and chocolate cupcakes and I use this recipe every single time. I can not give this recipe enough praise!! Simply amazing! I also just recently tried the buttercream frosting recipe and it was just as amazing! You are now my go to place for all my recipes! These turned out great. I was worried with how liquid-y the batter was, but put them in and the result was gorgeous fluffy cupcakes with a great depth of flavor. I was wondering if these could be made in advance and frozen and if yes, how ? You can certainly make these in advance and freeze them. Make sure to let them cool completely according the recipe instructions. You will then need to wrap well in freezer wrap and seal in a freezer safe container/freezer bag. Then when you are ready to serve them, thaw completely before frosting. Enjoy! I’m so glad you tried these and enjoyed them, Brigitte! And glad you didn’t skip the espresso powder – doesn’t it make the chocolate taste even better?! Thanks so much for your kind comment Brigitte – It means so much to me! Can I add a 8 oz container of sour cream to make it moister? I’ve not done that, Morgan. If you add the boiling water as in the recipe, these are incredibly moist. Hope this helps! Thanks! Love them! I substituted the oil (I’ve used coconut oil & olive oil), both worked great! 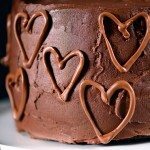 I feel as if I am always searching for the “perfect” vanilla and chocolate cupcake/cake recipes. I have a pretty nice vanilla cupcake recipe, but the “perfect” chocolate cupcake recipe has alluded me – until now!!! Made these exactly as written this morning – oh my goodness! They are wonderful. Perfect. 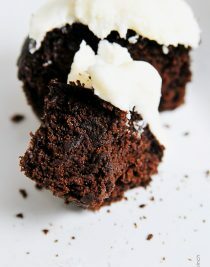 They are nice and moist, have the perfect crumb – dense enough to support frosting but not so dense that they are heavy. They are PERFECT!!! I am thrilled to have stumbled upon this recipe – thank you so much! I am certainly going to keep this one as my chocolate cupcake recipe – no more searching, hallelujah! – and I am going to try some other recipes of yours. You are brilliant and these cupcakes are IT! Thanks a million! Hi! Love this recipe. I know it can be easily doubled – do you know if it can be tripled? Thanks! 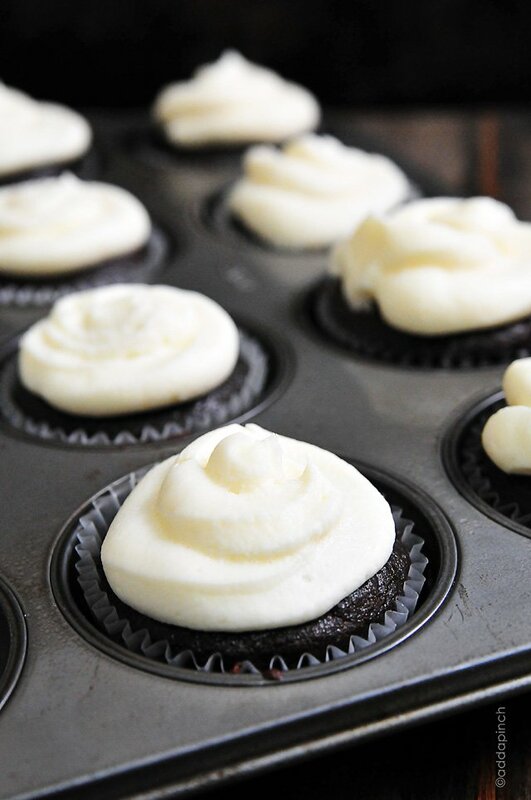 I’ve tried this recipe 4 times now and it’s my go to chocolate cupcake recipe. I’m making them into Andes Mint cupcakes for a bake sale this weekend and they are just delicious! Thanks Robyn! Is the Batter supposed to be super watery!!??? Did I do something wrong? Absolutely loved this recipe. Such good feedback!! Found that mine were cooked in half the time though! Well I didn’t have expresso powder but had Kaluah. I also added some baileys Irish cream cause…..why not? Fabulous. Can I substitute the vegetable oil with melted or softened butter instead? Or will it not make the difference? I don’t usually like using oil in cake recipes. Thanks so much! 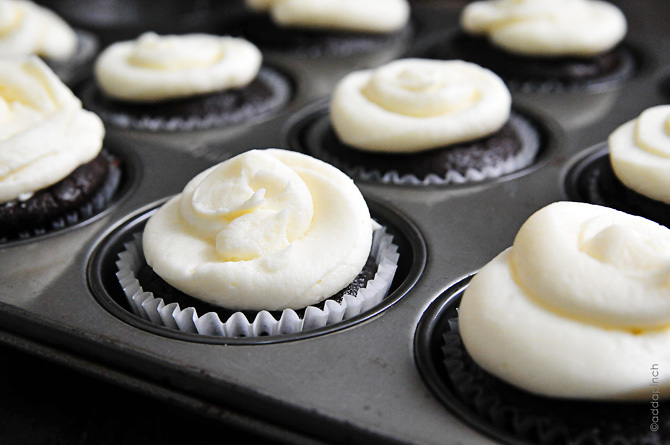 The oil helps to make the chocolate cupcakes moist and tender. Using melted butter in place of the oil did not give the same results when I tested. Unfortunately, the cupcakes i made didnt rise and it was dense. Could it be due to the fact that i used muffin tin instead of cupcakes tin? I’m really new in baking. The tins you used are probably not the issue – sometimes they are used interchangeably. It could be a difference in the type of flour or other ingredients used. I’ve never had a problem with them being too dense or being flat. I hope this helps. Thanks! These are the BEST cupcakes I have ever made or eaten! I made them for my daughter’s birthday and will definitely do so again. I topped mine with the chocolate buttercream frosting in the links above, because there’s no such thing as too much chocolate. I didn’t have espresso powder, so subbed 1/4 cup strong coffee for the boiling water, which worked perfectly. Highly recommended! Thanks! Yes, you can use cake flour if you wish, Kai. Enjoy!